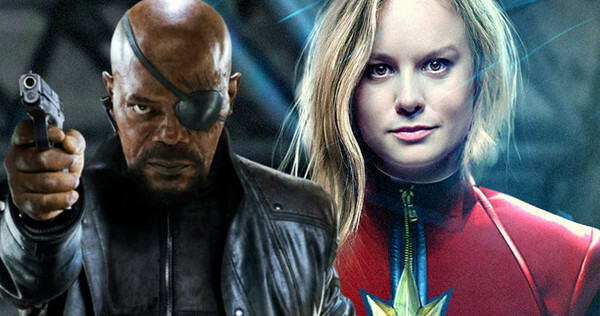 Despite the tremendous amount of love fans have for Nick Fury, and the actor who plays him (Samuel L. Jackson), the character hasn’t been featured too heavily in the Marvel Cinematic Universe as of late. And that’s definitely a shame. Though he was instrumental in putting the Avengers together, his role has been diminished quite a bit and he hasn’t been seen on screen since Age of Ultron. We do know, however, that he’ll be involved in Infinity War and its currently untitled sequel and now, it sounds like he may be sticking around beyond that as well. Though Jackson’s contract will expire after those aforementioned films, it seems like the actor isn’t ready to leave the MCU just yet, as we’re learning today that he’ll have a role to play in Captain Marvel. We first reported on this several months ago, when Jackson teased his involvement in the 2019 blockbuster and today, we’ve got some confirmation thanks to Deadline, who note that the actor is indeed on board. Unfortunately, there’s no news on how involved he’ll be, and with the movie still so far off and Captain Marvel not even introduced in the MCU yet, it’s impossible to say how Fury will factor into things. That being said, we imagine that the two characters will share some scenes in Infinity War to set things up for Carol Danvers’ solo film. Again though, we’ll just have to wait and see how this all plays out. With Marvel taking to Hall H at Comic-Con later this month, however, perhaps we’ll find out sooner rather than later? In regards to what we can expect from the Brie Larson-led flick itself, well, we don’t know a whole lot about it just yet. It has been revealed though that we’ll get to return to the Quantum Realm, which was first introduced back in Ant-Man. Apparently, it’ll give us “a better understanding of Carol Danvers and her place in the MCU,” whatever that may mean. Beyond that though, details on the film are scarce and we expect it’ll be a while before the studio really starts opening up about the project, given how packed their upcoming slate is. Captain Marvel graces theatres on March 8th, 2019. Tell us, how do you think Jackson will be involved? Take to the usual place and let us know!